Are you still managing your Lot Sales and Contracts with spreadsheets and paper files? 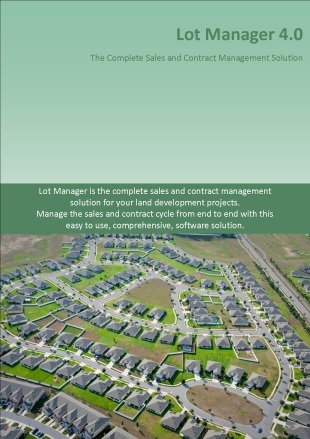 Lot Manager 4.0 is the latest version of Presence Systems' lot sales and contracts management system, built from the ground up for the land development and real estate industries. It is an easy to use, fully featured, comprehensive software tool designed to make the sales and contract management end to end process simple, efficient and robust. Management of estate, stage and contract data couldn't be easier with rapid data entry screens and comprehensive contract data entry forms that allow you to manage all aspects of the contract process. The data within Lot Manager 4.0 is instantly at your fingertips with our comprehensive range of management and operational reports. From contract status reports, overdue deposits, and rebates due through to monthly sales and transactions reporting, everything you need to effectively manage your sales and contracts process is available at the push of a button. Customer correspondence is automated, from welcome letters to deposit receipts, fees invoices to settlement instructions, all using your own customised Microsoft Word templates. Mail outs can be generated to target specific customers or prospects, ensuring maximum effectiveness of your marketing campaigns. Integration with Estate Master Development Management (DM) software provides users the ability to seamlessly import sales and settlement data from Lot Manager 4.0 into the DM cash flow model for up to the minute data on anticipated sales, settlements and commissions payments. This provides a more accurate and integrated solution for budgeting, cash flow forecasting and inventory tracking of development projects. Please click on the brochure below for further information, or contact us for a free 30-day trial.